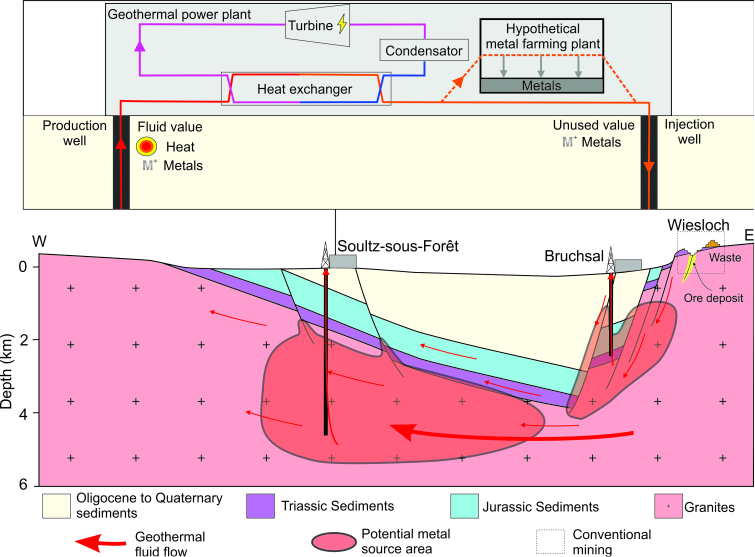 KIT - AGW: Geochemie & Lagerstättenkunde - Forschung - Metal extraction form geothermal fluids in the Upper Rhine Graben, a new mineral source? Our societies are going through major energy and technology shifts which deeply change our needs in raw materials. In order to meet these needs new alternative metal sources have to be found, especially for critical raw materials and rare metals (e.g. Li, Rb, Cs, Ge, B, Be, Sb…). A new promising mineral source is to extract metals from geothermal fluids. Geothermal fluids are used to generate heat and electricity but they are also enriched in a large suite of metals, which is not exploited. We investigate the Upper Rhine Graben potential for metal farming and highlight its viability in Baden-Wurttemberg. We are developing efficient selective precipitation mechanisms for the metals with the highest economic or strategic potential and we will test if these techniques can be implemented into operating geothermal power plants. This technology would provide significant economic benefits, help to secure the needs of Baden-Wurttemberg industry for certain critical and rare metals and would promote geothermal energy by improving its economy. Farming metals from geothermal fluids, however, is still in its infancy and faces many challenges. Developing tailored metal trapping mechanisms to the Upper Rhine Graben geothermal fluids is difficult because of their high salinity and complex matrix. Trapping mechanisms need to be selective, efficient, ecological, energy-saving and socially accepted and ultimately these techniques will have to be integrated into operating geothermal power plants which is very complex. Farming metals is expected to have less environmental impact, to be more sustainable and socially accepted than conventional mining. Additionally the project focuses on critical raw materials and rare metals which have not been systematically investigated. To maximize the chance of success tackle the problem from an ore geology perspective so to mimic and improve natural processes.